There exists congruent evidence from multiple analyses of different data that the Australasian Aegothelidae are the sister taxon of apodiform birds (Mayr 2002b; Mayr et al. 2003; Cracraft et al. 2004; Ericson et al. 2006). Extant Apodiformes include the Southeast Asian Hemiprocnidae (tree swifts), the globally distributed Apodidae (true swifts), and the Trochilidae (hummingbirds), which today occur only in the New World. All representatives of the Apodiformes are small to very small birds with a highly specialized aerial locomotion. In all species the proximal wing bones (humerus and ulna) are strongly abbreviated and the hand is elongated, so the carpometacarpus is at least as long as the humerus. The Aegothelidae have no Paleogene fossil record. 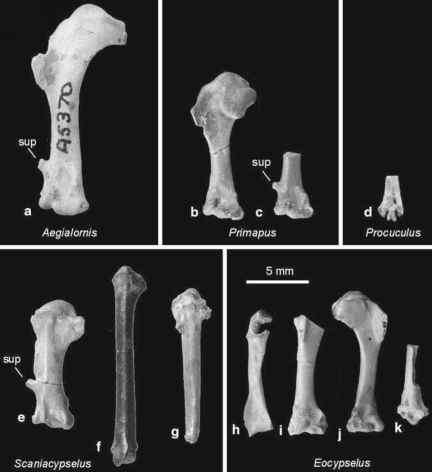 An earlier tentative identification of owlet-nightjars in the Quercy fissure fillings (Mourer-Chauvire 1982) was based on a fragmentary sternum, which more likely belongs to a species of the Aegialornithidae (own observation and Mourer-Chauvire 2006). Apodiform-like birds were very diversified in the Paleogene of the Northern Hemisphere, and their fossil record dates back into the early Eocene. 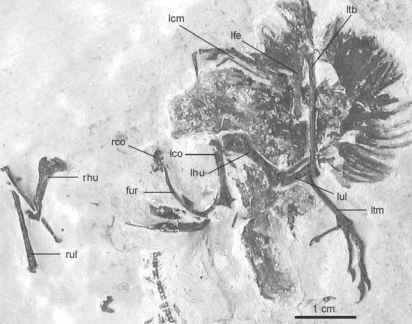 Although the published Eocene fossils are from European fossil sites, as yet undescribed apodiform birds were also reported from the Green River Formation (Feduccia 1999, p. 324; Weidig 2003). In virtually all earlier studies on Paleogene Apodiformes, the Trochilidae were omitted from comparisons, which led to a wrong placement of stem group Apodiformes into the crown group. In fact, most early Eocene species still belong to stem group Apodiformes (Mayr 2003c; see below). The alleged swift Laputavis robusta (Dyke, 2001) from the London Clay of Walton-on-the-Naze is certainly not an apodiform bird (Mayr 2001c; contra Dyke 2001c, d). This species differs from all representatives of the clade including the Aegothelidae and Apodiformes in the absence of a coracoidal foramen for the supracoracoideus nerve. On the basis of comparisons with specimens from the type locality in the collection of Michael Daniels, which were figured by Mayr (1998b, plate 11), L. robusta appears to be a stem group representative of the Coraciidae/ Brachypteraciidae (Sect. 16.7). This taxon of stem group Apodiformes (Mayr 2003c) was erected by Harrison (1984b) for Eocypselus vincenti from the early Eocene London Clay, whose holo-type consists of wing and pectoral girdle bones (Fig. 12.8). The coracoid resembles the corresponding bone of the Aegothelidae and is distinguished from crown group Apodiformes in the proportionally smaller acrocoracoid process. 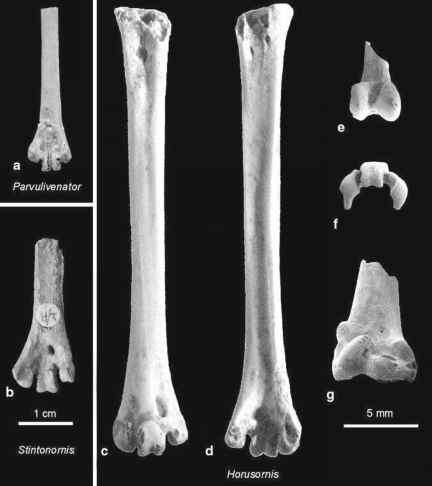 The humerus is stouter than that of nonapodiform birds, including the Aegothelidae, but is still less abbreviated than the humerus of crown group Apodiformes. Together with the more slender ulna, the humerus proportions suggest a position of E. vincenti outside crown group Apodiformes (Mayr 2003c). another peculiarity of Eocypselus visible in the Danish specimens, i.e., that its legs are very long compared with those of most extant Apodiformes (Fig. 12.9). Although Dyke et al. (2004, p. 54) noted that the osteological traits displayed by the Fur Formation specimens of Eocypselus "may serve to confirm a basal placement for this taxon within Apodiformes," they erroneously classified it into the Hemiprocnidae.